Arutz Sheva takes you inside a tunnel network used by the Hamas terror group to transfer weapons and terrorists into Israel from Gaza. Ever since the 2014 conflict with Gaza, Israel’s military has worked aggressively to locate and destroy the Hamas terror organization’s extensive underground networks which crisscross the Gaza Strip, and in many cases, extend into sovereign Israeli territory. Hamas and other terrorist groups have used such underground networks, dubbed terror tunnels, for years to move weapons, equipment, and terrorists around the Gaza Strip, as well as to launch sneak attacks inside of Israel. In June 2006, a cell of Gaza terrorists snuck into Israel via a tunnel running across the Israel-Gaza frontier near the Kerem Shalom crossing, and attacked an IDF position, killing two soldiers and taking a third, Corporal Gilad Shalit, captive. Eight years later, during Operation Protective Edge, Gaza-based terror groups expanded their use of tunnels for hit-and-run attacks on Israeli forces. Israeli security officials later uncovered a series of tunnels underneath an Israeli community near the Gaza border, and evidence Gaza terrorists were planning a massive attack on Israeli civilians. Since the discovery of the terror tunnel, Israeli forces have expanded their efforts to uncover and destroy the underground networks, resulting in the demolition of several major tunnels over the past few months. Earlier this month, Arutz Sheva joined Fox News’ Pete Hegseth in a tour of a stretch of a terror tunnel discovered by the IDF several years ago. 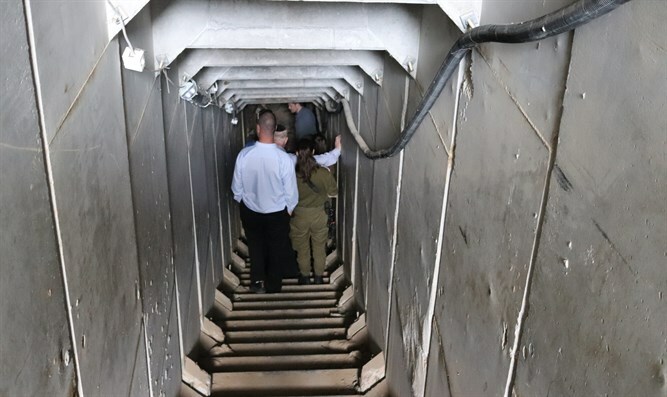 “The purpose of this tunnel is to get military, terror troops inside Israel from Gaza to do massive killing inside an Israeli village or Kibbutz near the border,” the deputy commander of the IDF’s Gaza division, southern brigade told Arutz Sheva during a tour of the tunnel. The tunnel network extends nearly three kilometers (1.85 miles), with an entrance inside the Gaza Strip, and two separate exits inside Israel. Given the location of the exits, the deputy commander explained, the tunnel was clearly intended to enable Hamas to carry out large-scale attacks on civilian targets.